On Wednesday 9th August 2017, I was fortunate enough to attend Jamie Whitham’s Track Training School at Mallory Park. 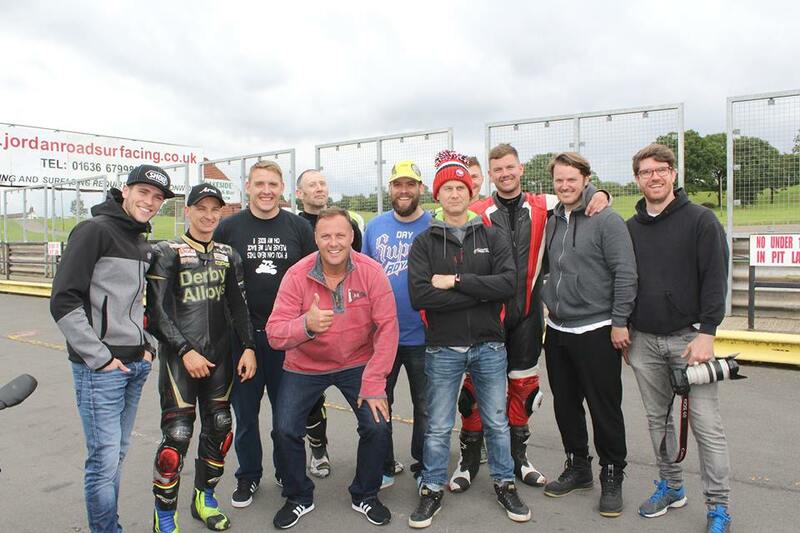 Having previously done only a few track days and never any where I had received top quality coaching by some really high profile, big characters in the racing world, I didn’t really know what to expect. All I knew was that I was excited, borderline nervous and aiming to improve my track riding! The first bit of track time starts at 9am, so we were expected to be there for 8.15am for signing on and briefing. Everybody has to attend the safety briefing in the morning, which is compulsory. It doesn’t matter whether you’re a track veteran or a complete newby, no one is exempt. The safety briefing is led by James Whitham and Paul Drinkwater, and for those who have been living under a rock, Jamie is an Ex British Super Bike and World Super Bike rider as well as a Motorcycling racing commentator who can usually be found in Paddocks nationwide interviewing riders for us to watch on T.V. Paul Drinkwater aka Drinkie is the brains behind the school, who noticed a gap in the market for a low numbers/ high quality track tuition day and is responsible for approaching Jamie, making a plan, making it a reality and the success it is today. 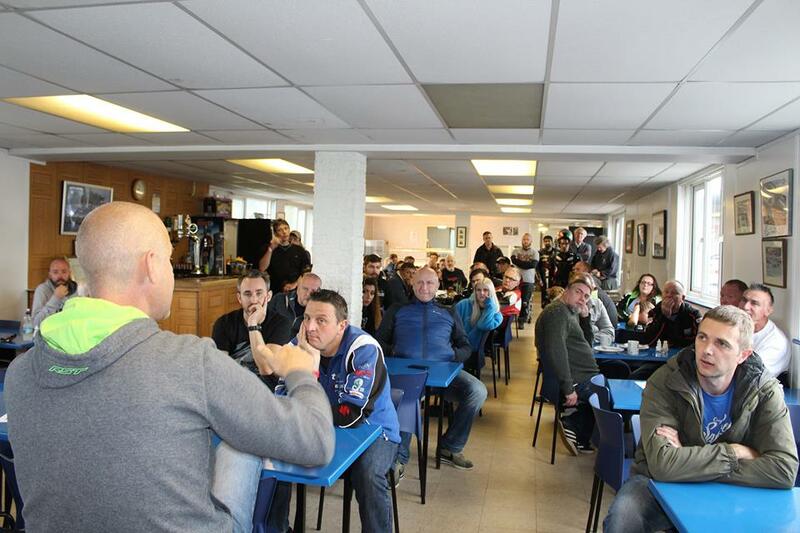 In the briefing, it is here you’re taught track etiquette, what the different coloured flags mean, how long you get on track, what groups are available for us to ride in (novice, intermediate or fast) and who our allocated instructor/s would be. Jamie asked if the instructors had a preference on which groups they’d like to coach for the day and they all picked between themselves who they would like to mentor. 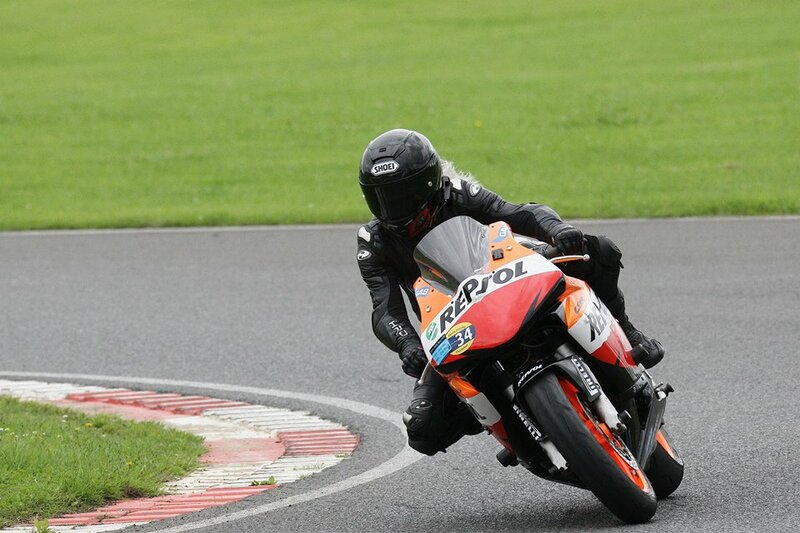 I put myself in the novice group as it was my second time riding my new CBR600RR (well, new to me!) around a track, and having never owned or ridden a proper sportsbike before, riding this bike is taking some getting used to! The mentors that decided they were going to coach the novices were Steve Brogan and Jake Dixon. 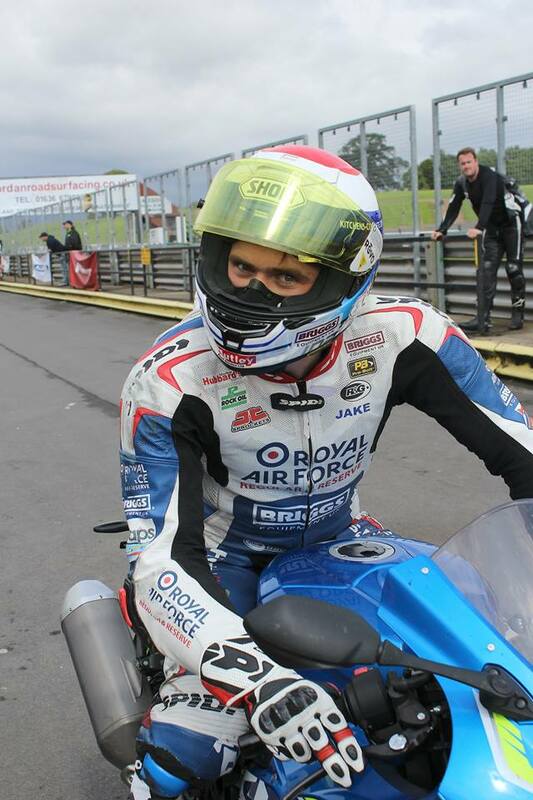 Ste Brogan has had much success in British Supersport, Superstock and Superbikes and he was champion in the BSB EVO class in 2010 as well as taking the National Superstock 1000 championship title in 2008. 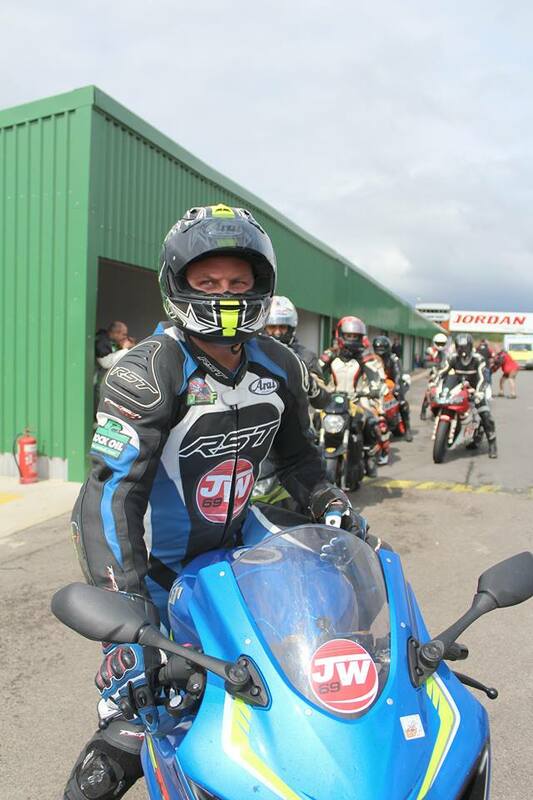 He also raced in numerous European Superstock and World Supersport races between 1999 and 2004, so the man has a wealth of experience and knowledge that he is ready and willing to share with JW Track Training attendees. After briefing, we all left the building and walked over to our bikes, it was absolutely bucketing down! It filled me with dread as I’d never ridden on track in the wet before, particularly on Pirelli Supercorsas, which I was quite concerned about as i’d heard horror stories about how they perform in the rain. Don’t get me wrong, I cannot fault them in dry conditions, especially when teamed with tyre warmers! I run a V1 Supercorsa SC1 on the front and a V1 Supercorsa SC2 on the rear and in truth, I don’t think i’ll chose a different tyre when it’s time to change as they give me that much confidence in the dry. The weather forecast said it should be drying up in the afternoon, so I decided to wait it out until it had dried up a little! At first I was concerned that if I sat out the morning and replaced practical with theory, I would miss out on those important sighting laps however I was reassured by Jamie that for those who wanted to rejoin the group on track when the weather had dried up a bit more, we would be taken round with an instructor behind us to do some sighting laps before getting stuck in. Whilst the people who were happy to ride in the rain went out, we went up the main tower building for some classroom sessions. Up here, you are situated right in the middle of the track, so you can almost see every corner there is! It was good to watch the brave rip it round the course with the spray flinging up from their rear tyres! In the classroom based session, it is Jamie Whitham that leads the class. 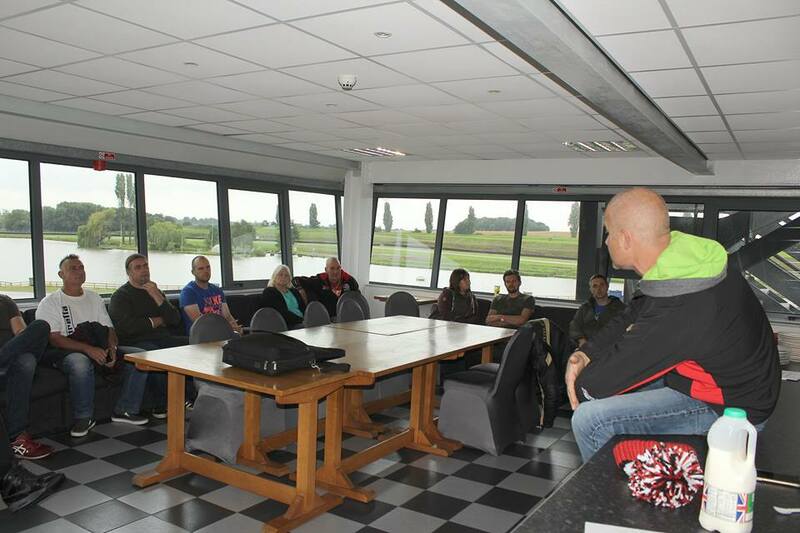 He is prepared and has a list of topics that he discusses with you, for example braking points, body position, counter steering, corner entry and exit, throttle control and racing lines, along with lots of other things. He asks you if there are any specific things you would like to know and opens it up to the students. You can leave or join these sessions at anytime. As dinner time arrived, it was looking a lot drier out on the track, although it was still a little damp. You could see that the most used lines were drying up a little quicker than the parts of the track that didn’t get much use. It was now or never so I decided to put on my big girl pants, man up and get out there. It was the first time out there for me and a few others, so we were led round the track by Jake Dixon for the first sighting laps. Not going to lie, I started off terribly! On the sighting laps, it was apparent that when going quick, this track was going to be far more technical and physically demanding than Anglesey was! With the notorious hairpin, chicanes, s bend and bus stop! After the sighting laps, off we went! I just felt like I couldn’t get to grips with the track in the first session and I rode around bolt upright, which doesn’t really help you get round bends! Thankfully, it wasn’t just me who had a terrible first session as when all the novices came in, Ste Brogan savagely dressed us down. So at the thought of hanging off around such a tight track, I was pretty apprehensive but I am a massive over thinker. I remembered that when I went to Anglesey, I thought I was hanging off like Rossi himself. Then I looked at the pictures and it was embarrassing! My lean angle was decent but it didn’t even look like my bum left the seat! 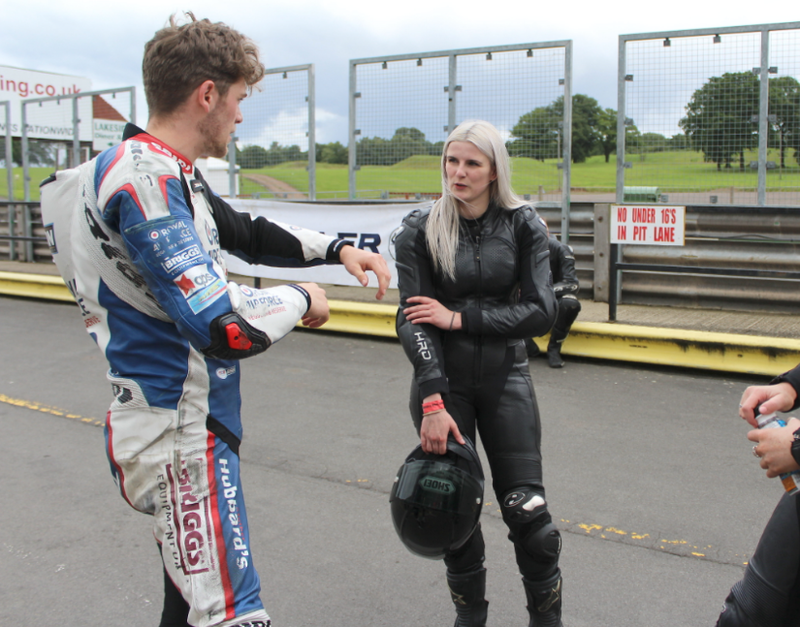 I approached Jake Dixon before we were set to go on track and I asked him for advice, his words of advice were “Hang off and when you think you’re hanging off as much as you can, exaggerate it even more” with that in mind, I joined the line up for the track. Off I went, putting what I had been told into practice. Hanging off felt a bit unnatural at first but it became obvious that it was allowing me to get round the chicanes in a much more flowing and fluid manner. The hardest bit for me out of the whole track was the hairpin. I just hate the damn things. On my road bike, a naked KTM Duke 690, throw a hairpin my way and i”ll be smiling the whole way round. 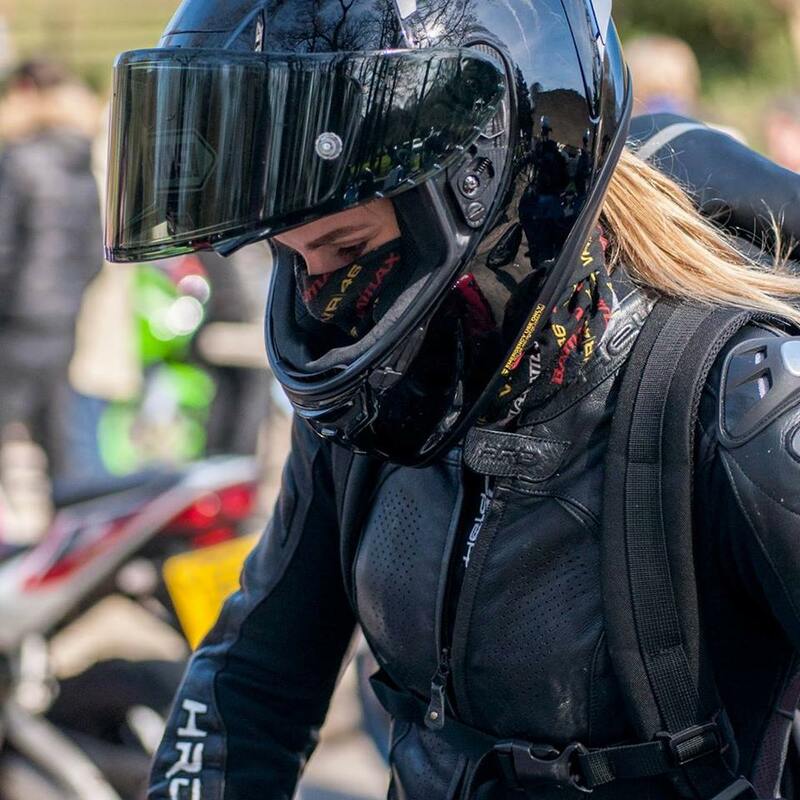 Throw a hairpin my way on a Sports bike, where my body position feels horizontal and I literally feel like i’m just gonna lie the bike down mid way round. I just cant get a smooth throttle to save my life and it makes it really hard work. To the point, when i’m riding around the track, my mind is distracted because i’m thinking, oh my god i’m coming up to the damned hairpin again! 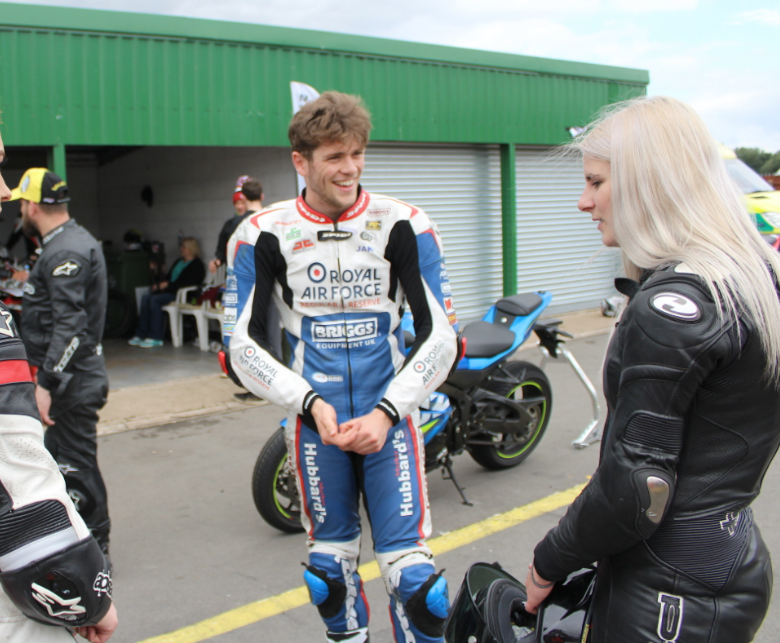 When I exited the track after 20 minutes (you get 20 minutes on, then 40 minutes of discussing your riding with an instructor whilst the two other groups get their 20 minute track sessions in), we put our bikes in the garage and all grouped around the instructors. Jake and Ste would talk about some general observations to the group and then after this, you can approach them and ask them for help on anything you need. I spoke to Ste who had noticed my hate/hate relationship with the hairpin. He recommended I tried it in first gear as I was clearly struggling with second gear. I took that approach on the next session and it did help. I just think the only thing that will get me better at hairpins is increased track time and practice. The beauty of Mallory park is that to us novices, a whole lap is roughly 1.15 mins, so you can learn the track very quickly. After speaking with Ste, I spoke with Jake. Jake said he would observe me and ride behind me, then he would get in front of me, tap the back of his bike and I was to follow his lines. 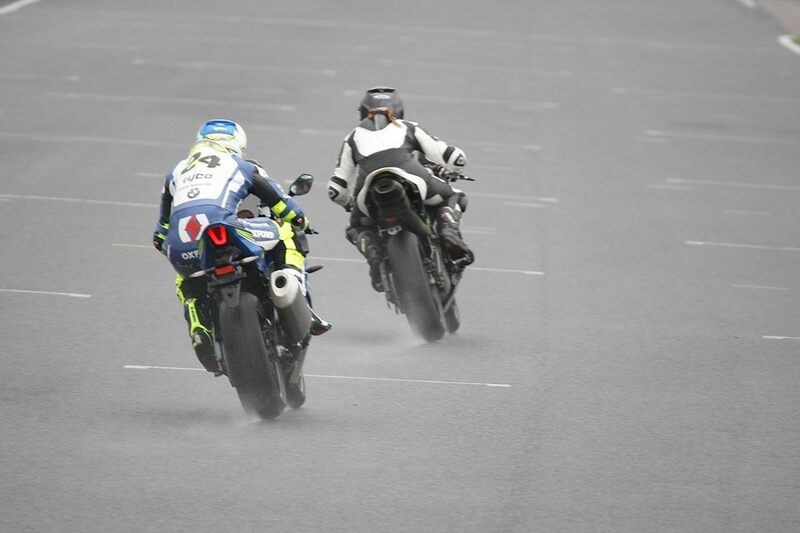 It’s an amazing feeling chasing a BSB rider around a track and doing your best to stick to their tail! It made me laugh actually because on Gerrards (one of the longest right hand bends in the UK), he nonchalantly turned around to see where I was and he didn’t expect me to be right there behind him, he seemed shocked and picked the pace up, which was obviously nothing to him but meant I had to up my game! After this session, Jake took his lid off, walked up to me and said ‘THAT WAS F**KING AWESOME”, I was so happy, it was the highlight of my day! Because it meant I must have made progress for him to say that to me! He did say to me at one point in the day however, that I transform into a completely different rider when i’m on the hairpin, and I agreed with him because I just cant gel with it! More time on the track with the bike and it’ll click i’m sure! At the end of the day, you could feel that the atmosphere was a positive one, with everyone sharing anecdotes of things that had happened in their day on track and there was a real nice, team spirited vibe. I think the general consensus was that we all felt like we had improved and made some progress. On the final session, it felt like a mini race between everyone on track as we were all pushing hard with it being the final session. To summarise my experience at the Jamie Whitham Track Training School, I would say that it was an incredibly fun and informative day. I left extremely satisfied and feeling good! I felt as though the tuition helped massively with my confidence and I ended up loving a track that I wasn’t keen on at all when I first went out on the sighting laps. I love the fact that if for whatever reason you decide not to go out for a track session, you can still learn some theory in the classroom, and you are learning from the best. I also think it’s really good how unlike normal track days, the maximum number of riders on track at any one point is 20, meaning plenty of space on the track to focus on your personal development instead of worrying about being cut up or undertaken by a hoard of riders etc. 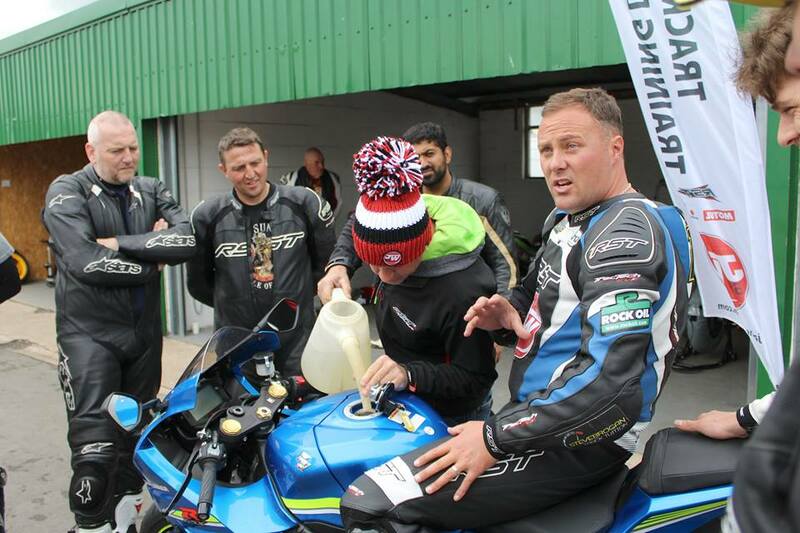 Jamie hosts these Track Training Schools at other locations too, so as well as Mallory, other locations across the UK include Anglesey, Knockhill and Croft. Obviously, certain instructors may or may not be available for the dates that they run these events, but Jamie has a wealth of World Class Riders in his team, so if Ste and Jake cant attend, I’m sure the likes of Christian Iddon, Jenny Tinmouth, Dan Linfoot, Ian Hutchinson, Davo Johnson, Dean Harrison, Richard Cooper, Taylor Mackenzie and Lee Johnston will be able to help you on your journey to improvement! Although I haven’t been on any other track tuition days, what I will say is that for the level of tuition you receive combined with the amount of track time you get, it is extremely good value for money. If you have any question, please don’t hesitate to ask in the comments box below. 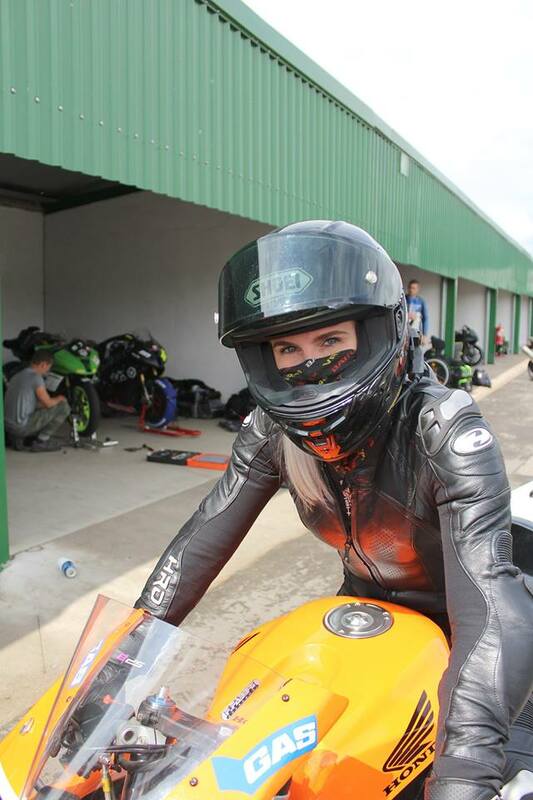 Thank you Metzeler and Pirelli for allowing me this amazing opportunity!